Your help is needed to secure this icon of engineering excellence for British aviation heritage and bring the original Cushioncraft CC7 back to the Isle of Wight. The Trustees of the Wight Aviation Museum have launched a fundraising appeal to rescue an original Cushioncraft CC7 hovercraft. The Cushioncraft CC7 was built in St Helens on the Isle of Wight and the museum are hoping to raise enough cash to bring it back to the Isle of Wight for good. “We are urgently appealing for your help to rescue an important part of the Hovercraft story on the Isle of Wight. We are asking for donations to rescue an original Cushioncraft CC7 built here at St Helen’s Duver. 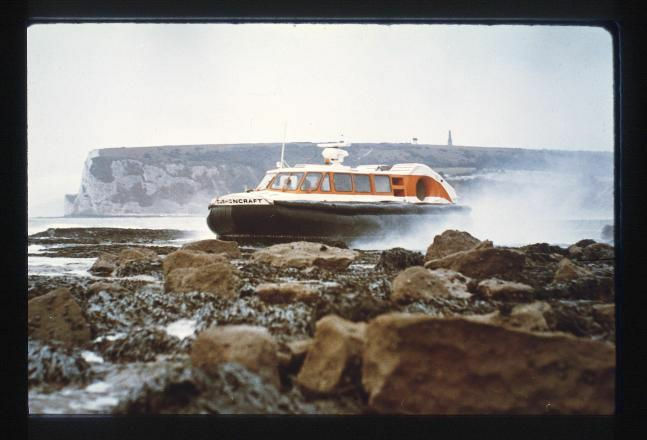 News of the unexpected availability of the craft, came when Warwick Jacobs, founders of the world’s first Hovercraft museum, called to tell John about it. According to John, it’s possible this craft may be sold off to a potential buyer from overseas at auction in January. If you are able to donate something towards the appeal, as little or as much as you can afford, you’ll be helping Wight Aviation Museum return this Cushioncraft to the Island where it was made. Find out more about the Wight Aviation Museum by visiting their Website. Our thanks to Anne Grant of Solent Aviatrix – a Website dedicated to woman pilots of the Solent – for sharing news of this appeal. 2 Comments on "Appeal to bring home original Isle of Wight built Cushioncraft CC7 hovercraft"
By the year 2000 we will all be commuting to work in Cushioncraft & jet packs, wearing shiny silver boiler suits made from Bacofoil.